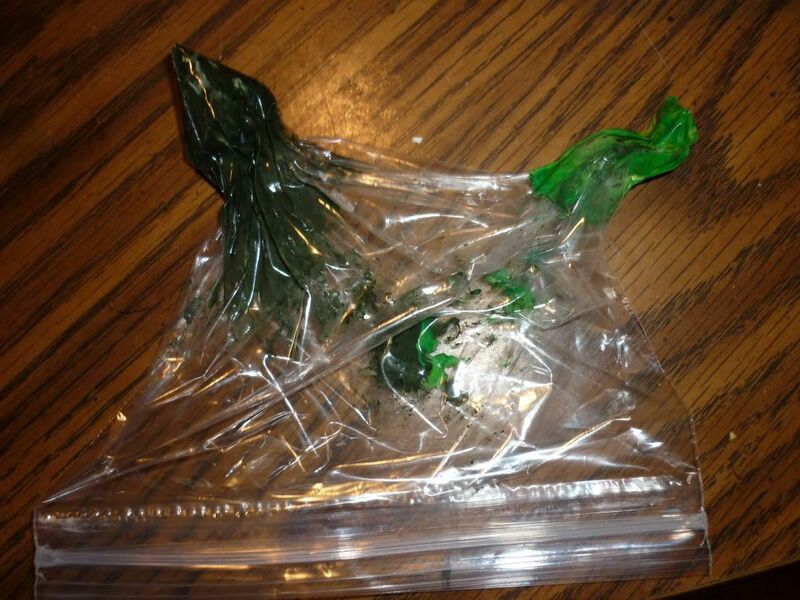 That was one of my Thanksgiving dinner contributions. 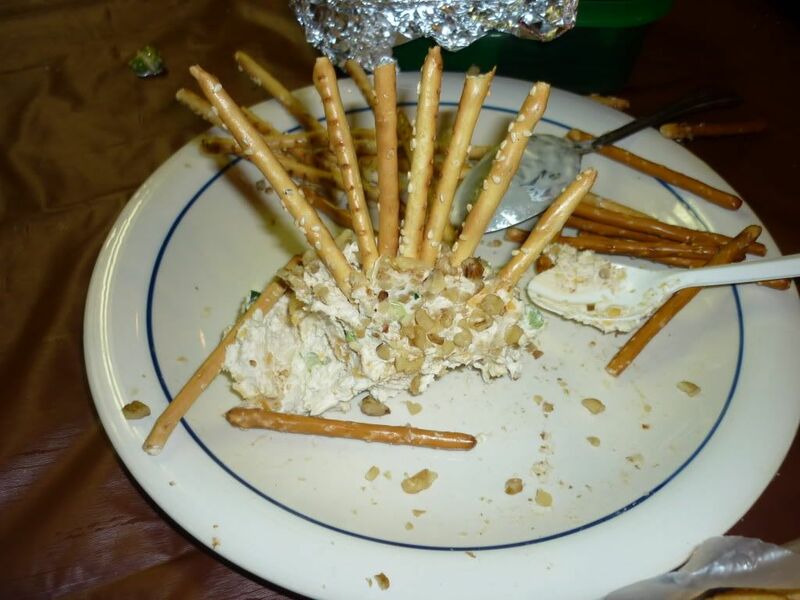 I can’t even remember which cheeseball recipe I used, but it was delicious, rolled in a mix of chopped walnuts, almonds, and pecans. What? I couldn’t decide. The wattle is made of a tiny piece of spaghetti, soaked in red food coloring. The neck and head piece are from a Slim Jim that I forced to hold its shape with a clip for a while. And the tailfeathers? They’re a combination of pretzel sticks in the front and larger sesame sticks in the back row. By the end, only a few tail feathers remained, and even those didn’t make it through the night. Delicious. You might like these related posts! 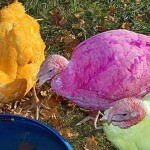 Colored hens for Valentine’s Day, Easter, Thanksgiving? 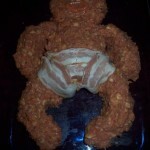 Meat loaf baby with bacon diaper – Don’t eat the baby! Wow, I’ve never seen anything quite like this! 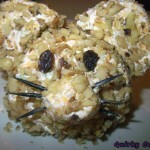 Thanks for submitting it to my Thanksgiving blog hop! Very creative. This is awesome..Thanks for sharing. Pedey @ Do You Smell That!!? 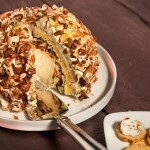 One of our family traditions is a cheese ball – it only makes an appearance three times a year – Thanksgiving, Christmas & New Years. Thanks for a wonderful idea of how to dress it up for the holidays! Yummy idea! I’ll have to see if I can find gluten-free pretzel and bread sticks so everyone can enjoy this. 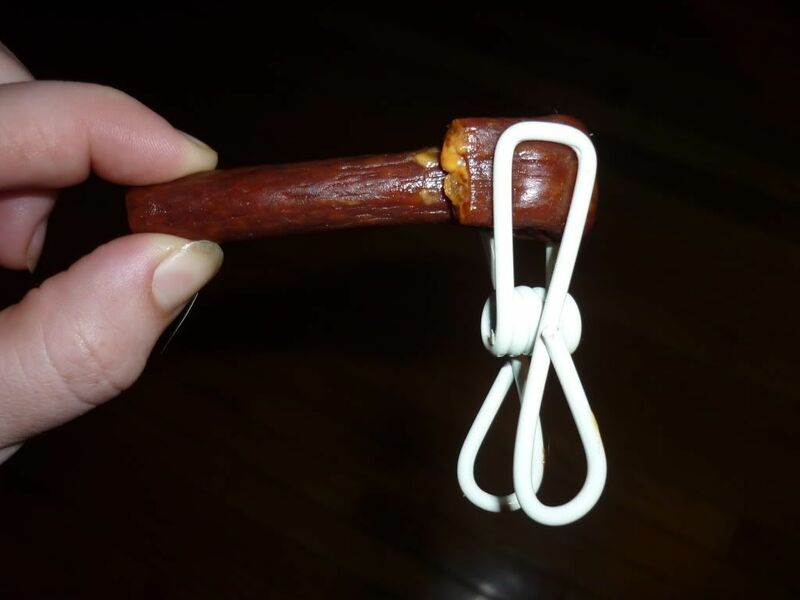 I like the trick with the Slim Jim too. Jessica – Your turkey is lovely!! Super idea! 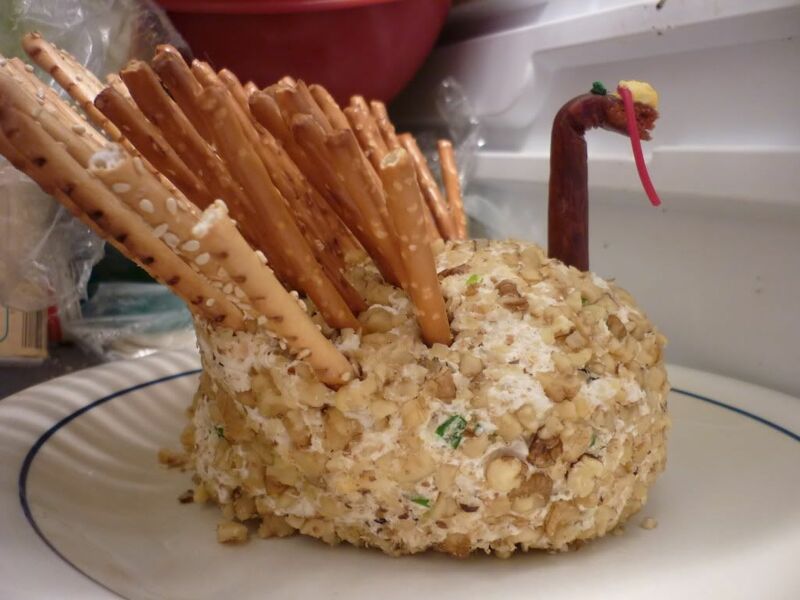 This will be on my family’s snack table for sure this year. I got to thinking about alternate ways to make the eyes, beak and wattle. The tip from one of those mini yellow bell peppers might make a great beak. A wattle could be fashioned from one of the red bell peppers, also. The rest of the peppers in the package could be sliced into wedges or cut in to halves and put on the tray with crackers or whatnot. 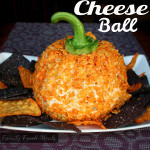 They would taste great stuffed with cheese from this turkey ball. Capers would be great for eyes, or split peas (dried or a frozen pea cut in half) or maybe even the very tip of a green olive. 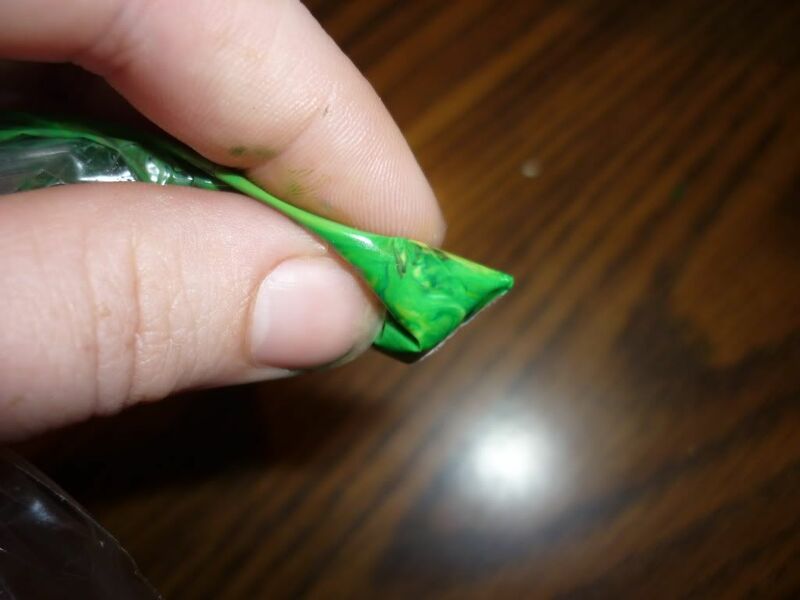 When I tried to bend the slim Jim, it broke. Anyone else have that problem? Try to just warm it up in your fingers and work at it more slowly. If it’s breaking, then it may be too cold and the fats are more stiff in there instead. Give that a go and see if it helps. 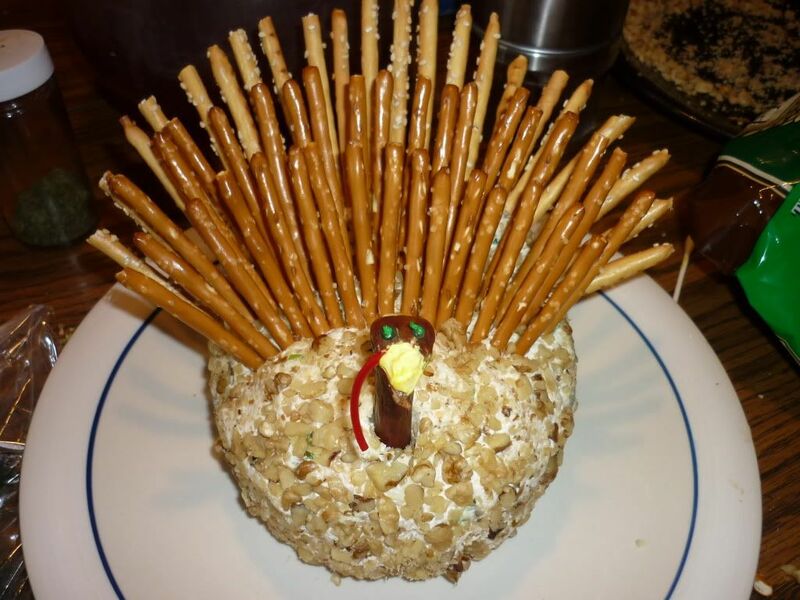 I always make a cheese ball for the holidays and this is a cute idea to dress up the cheese ball I am going to use different crackers for the turkeys feathers. 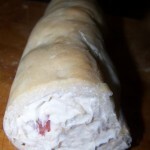 « Facts About Food Friday – Did the power go out while you were away?